SUMMARY: An email mix-up leads to a romance between 17-year old Ellie and a mysterious stranger known to her only as GDL824. It turns out that GDL824 is a famous teen movie star who is about to start filming his new movie in Ellie's hometown. WHAT I LIKED: Cute, sweet, and fun! I know this book will find a captive audience among my celebrity-obsessed middle school girls. Imagine discovering you were corresponding with someone you had a lot in common with, then finding out that person was a star! 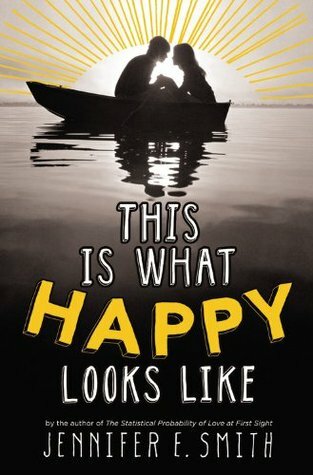 I appreciate how This Is What Happy Looks Like examines the dark side to fame: the hounding paparazzi, the lack of solitude, the surreal feeling that your life will never be normal again. Graham's life may seem perfect, but he feels stifled by the fame and longs for normalcy again. While he loves acting and not having to worry about money, he misses his relationship with his parents and never feels like he is truly alone. I like how this is told in alternating voices (Graham's and Ellie's) and partially in emails between the two. The emails help make the romance believable. Many professional reviewers including Booklist, Publisher's Weekly, and School Library Journal recommend This Is What Happy Looks Like for high school readers, but I think it is just fine for middle school as well. There is no profanity, violence, or drug use. The sexuality is limited to a few kisses, none of which are described much beyond "he kissed her" or "she kissed him." The two protagonists are high school age (probably the reason for the HS recommendations), but content is perfectly fine for MS readers. As a middle school librarian myself, I am always on the lookout for clean romances for my young middle school girls; This Is What Happy Looks Like fits that bill nicely. WHAT I DIDN'T LIKE: For me, this one was a little boring. It took me over a week to finish it, and 416 pages is too long for this kind of story. Nothing much really happens beyond a lot of examination of feelings and thoughts. Ellie and Graham are a little boring, but I liked them okay. I could not stand Ellie's best friend Quinn or Ellie's mother. When Quinn and Ellie have a disagreement early in the story, it is Quinn who keeps the silly argument going for several weeks despite Ellie's many attempts to patch things up. Quinn ignores Ellie even though they work together and generally acts like a child about the whole thing. I know this type of immature behavior is realistic for teen girls, but I never felt like Quinn really redeemed herself when she finally "forgives" Ellie. I kept asking myself why on earth Ellie would want a friend like that. Ellie's mother also seems selfish and silly. She wants Ellie to break things off with Graham in order to protect Ellie's identity, but I kept wondering who would really care about Ellie's identity if it did get into the news. Sure, it might be a footnote in some obscure news article, but really, I don't see it being that big a deal. Her life isn't in danger, and even when the news finally gets out, nothing really happens as a result. Ditto with Graham's indiscretions--nothing ever happens even when the news story breaks. THE BOTTOM LINE: A clean romance for middle school girls, This Is What Happy Looks Like is sweet and believable and will appeal to girls who love to read gossip magazines. It has only one major conflict (which is comparatively light), so those looking for action or high drama may be disappointed. Thank you! I haven't been able to get a copy, but if it's appropriate for MS, I'll order and THEN read. it!